We are starting to get settled into the new place and we are especially loving the neighborhood pool. Since the temperatures are so hot this week we have been there every single day! We are doing our best to try to stay cool. We love to take snacks to the pool because it seems to be an all day affair. All of my kiddos are water babies and could swim all day long. I have seen this Poolside Dip everywhere and decided to give it a try! It had all of the ingredients I love in it plus it snuck some veggies in for the kids. 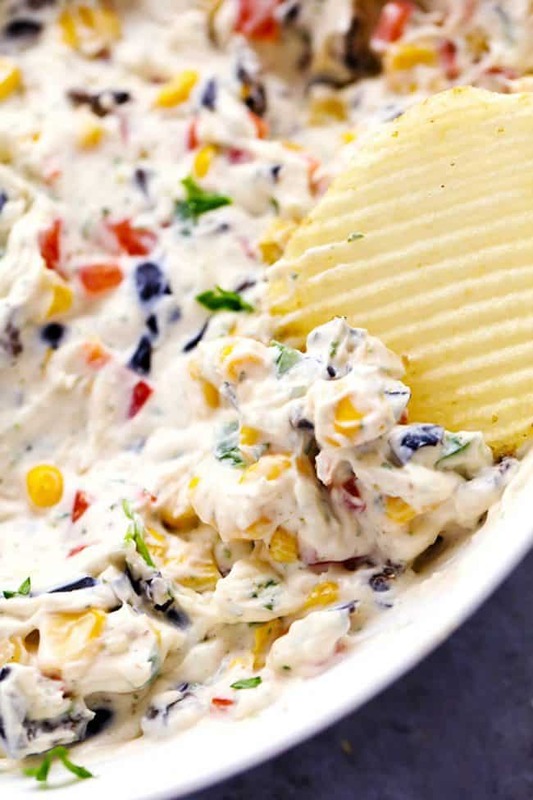 This dip is positively addicting and we couldn’t get enough of it! It has red bell peppers, olives, corn, olives and a jalapeño for some added kick. I was worried about the veggies in it for my kids but they didn’t even notice! 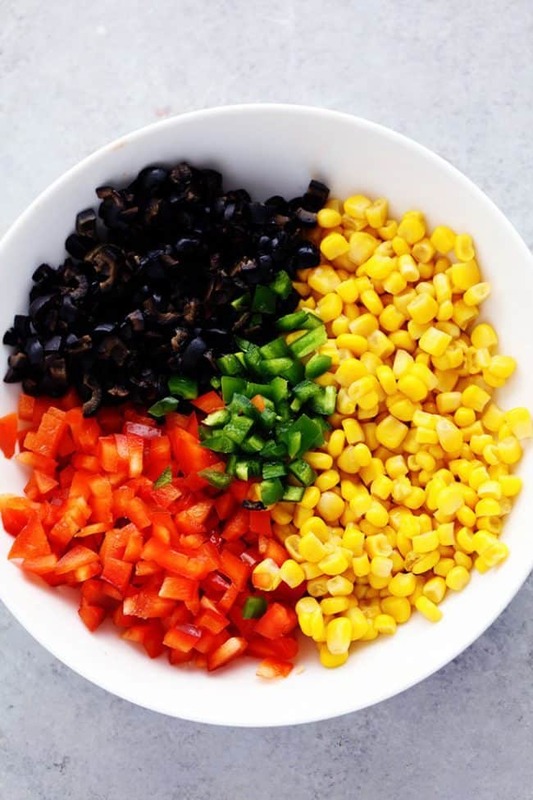 All of these ingredients come together so well in this creamy dip adding such flavor and texture. 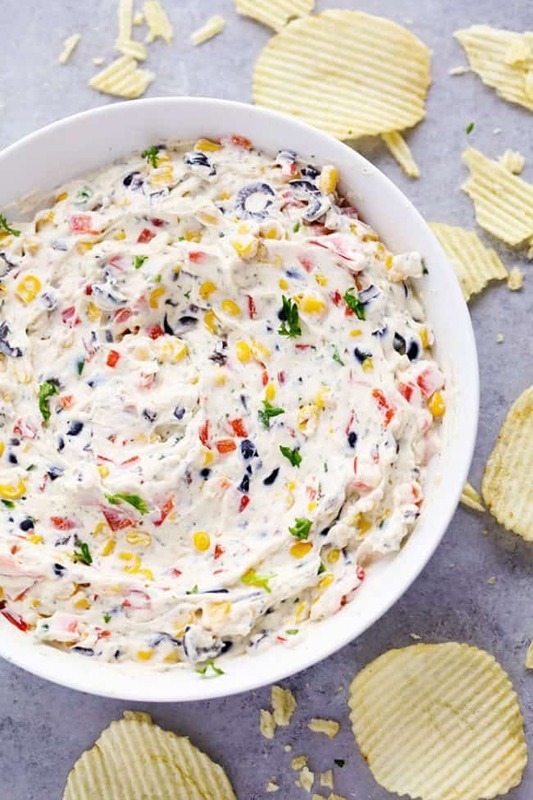 Whether you are heading to the pool or to a potluck plan on taking this dip with you! It is incredible! It will be the most addicting and delicious dip you ever eat! 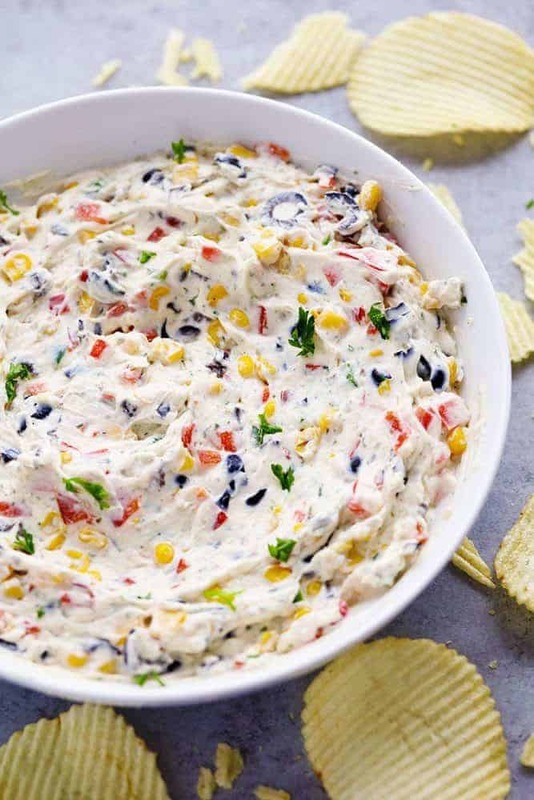 I made this loaded ranch dip but it was way too salty. I added about a half cup of sour cream and that helped. I also bought chopped black olives which was a mistake. It was a yucky gray color. Guests still tried it, but I noticed that you had a comma followed by chopped. Maybe that was my mistake. I think adding black beans would be good too. Good recipe but it wasn’t as great as I’d expected. Thank you for sharing! I am sorry it didn’t go as planned. I hope your next recipe works out better for you! I made this according to recipe. I was careful to pat everything dry. I served it the next day, love the taste , but it got runny. Anyway to keep that from happening? Maybe more cream cheese? Or should it just be served the same day? I made this and it looked nothing like the picture. It looked like olives, corn, and peppers with a little bit of cream cheese. What did I do wrong?! I think if you added a container of sour cream it would look a lot more like the picture! I make it with 16 oz cream cheese and it is perfect every time! I agree, adding sour cream is exactly what is needed! I followed the recipe exactly and it turned out just like the picture. It was delicious! I took it to a pool party and everyone loved it! Just made it and it’s just like the picture and tastes great! I have made this a few times and it’s a huge hit! It’s my new go-to for something quick and easy! I did have to make one change- my husband WONT eat olives, so I substituted 1/2 a can of black beans. I think this would be good with some taco seasoning. This is an amazing dip! I use 2 block of cream cheese plus I add black beans & shredded cheese to mine when making this, soo delicious! 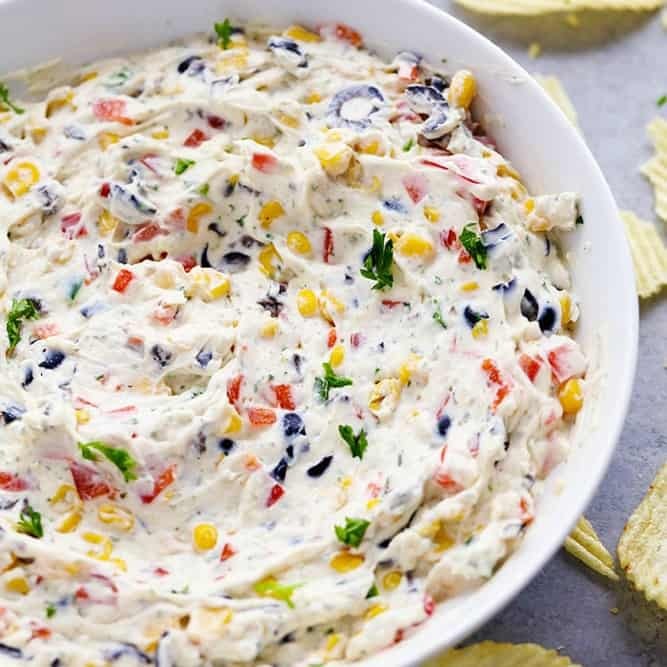 I have made this dip for two different occasions and everyone loved it. Will make it again soon. I’m wondering if you can substitute black beans for the black olives. I substituted the black olives for black beans and it didn’t change the color whatsoever. Rinse your beans first! We make this dip a lot and have found ways to even revamp it a bit. We use whipped cream cheese, a bit of soir cream and also added well rinsed and dried black beans to it. Also rinsed and dried the olives well so it does not change the color. We will add shredded rotisserie chicken to it and sometimes shredded cheese and serve it on mini slider size rolls! Its so good and a versatile dip that can be doctored up in so many ways. hi ! i made it and did add a little sour cream. next time i will use less of the ranch dip, because of the salt. I have made this dip countless times and it always gets rave reviews. it is so addictive, poeple cannot stop dipping into it once they start. I make a day ahead and it seems to meld the flavors together. I also use 2 – 8 ounce package of cream cheese, with no sour cream. Perfect everytime. I also use 2 – 8 ounce package of cream cheese, and 2 Jalopenos, with no sour cream. This is seriously one of my FAVORITE dips! I’ve made it for numerous functions now and everyone loves it! It’s perfect with Ruffles. It is something that you need to make the same day it is going to be served though. It is salvageable the day after making it but is MUCH better the first day. After the first day I’d gets runny. So keep this in mind when preparing. Thank you for this recipe!!! !